‘Nerano’ is one of just nine exclusive apartments within La Marinella, an elegant eighteenth-century building in an enviable position, just 50 metres from the beautiful Marinella beach. The Marinella beach resort is a brief stroll from your apartment. An agreement between the resort and La Marinella allows you to enjoy access to the restaurant, bar, newsagent, beach cabins and umbrellas for the same price as the locals enjoy which is small discount on tourist prices. Just perfect for socialising with friends, or merely soaking up the sunshine. ‘Nerano’ is a bright, spacious apartment on the first floor of La Marinella, for 6 people. The central living area includes a modern kitchenette with a fridge-freezer, toaster and Italian coffee maker. There is a dining table with seating for six, plus a comfortable double sofa bed and satellite television. The double bedroom is simply designed with an efficient use of space and stylish furnishings. From the window there is a stunning view over rooftops to the mountains beyond. There is a television and plenty of storage. 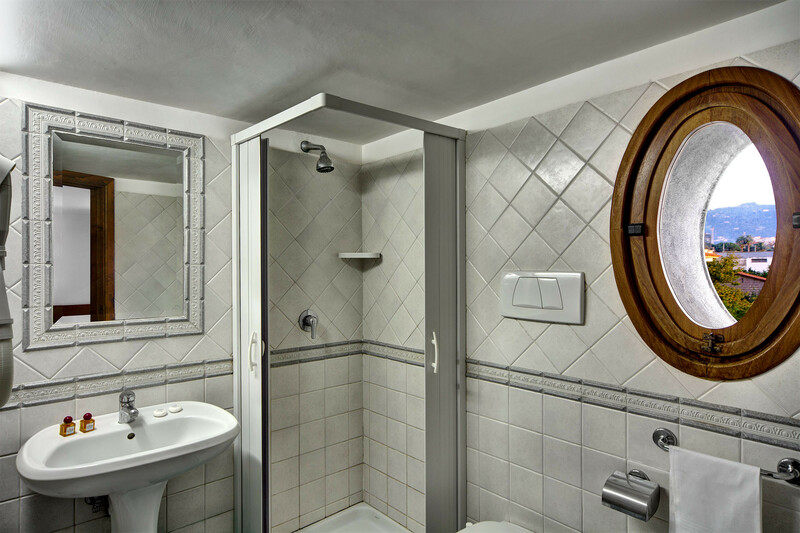 The en suite bathroom has a characterful porthole window, and clean, crisp white tiles. 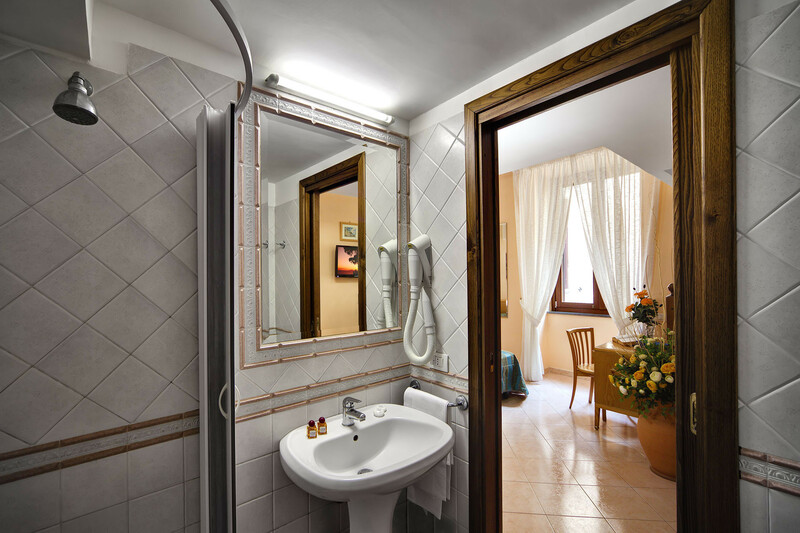 There is a washbasin, toilet, bidet, hairdryer and a spacious enclosed shower. The two twin bedrooms can be made up as doubles on request. Like the double room, they have tasteful décor and ample storage for clothing and belongings. One twin room is accessed via a staircase from the other, and is on a mezzanine floor. The second en suite bathroom is also well appointed, with a washbasin, toilet, bidet, hairdryer and a roomy enclosed shower. There is air conditioning throughout the apartment for your comfort even when temperatures are soaring outside. A Wifi signal is available, although this is not strong throughout the apartment. A telephone is available at extra cost. There is a washing machine and an ironing board and iron are available on request. PS II. : Note: From 1 April to 31 October the Municipal Council of Sant'Agnello has instituted a mandatory tourist tax on all temporary residents. The tourist tax must be added to the total amount of stay and has to be pay cash at the arrival. The fee is 2.00 euros per person per night, and only applies to adults and up to 7 nights. TV, TV Satellite, iron, internet (Wi-Fi), hair dryer, 90 m² property, air-conditioned.